Artists, travelers, and wanderlust dreamers have flocked to Sintra, Portugal for centuries. In a letter to his mother, the British poet Lord Byron wrote, “[Sintra] contains beauties of every description… Palaces and gardens rising in the midst of rocks, cataracts and precipices; convents on stupendous heights, a distant view of the sea and the Tagus.” Sintra, just 17 miles north of Lisbon, has lost none of its charms since Lord Byron’s letter in 1809. Discover the magic for yourself with AESU, and explore the castles of Sintra! Pena Palace was built in 1836 and is one of the Seven Wonders of Portugal. 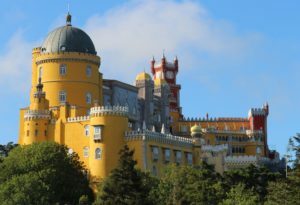 With its vividly painted exterior and fairytale architecture, the combination of historical styles has established Pena Palace as a truly unique destination. The palace is located on top of the second highest point in the Sintra Mountains, so don’t forget to pack a pair of comfortable shoes! The doors are open all day (from 9:30 am to 8:00 pm) so it’s easy to coordinate the visit with your schedule. Hans Christian Anderson, the author of The Little Mermaid, once likened the famous chimneys of the Palácio Nacional to two “champagne bottles.” The Palácio Nacional is the best-preserved medieval royal palace in Portugal, known for its minimalistic gothic exterior and decorative staterooms. Portugal’s ruling nobility resided in the Palácio from the early 15th century to the late 19th century, and its interior serves as a museum to those families. Built in the 8th and 9th centuries, the Castle of the Moors is classified as a National Monument. Although the Moorish Castle may not be as vibrant as the other Sintra landmarks, the surrounding lush forests and parks create an irresistible appeal. Visitors walk the vast and intricate stairs overlooking breathtaking panoramic views of the landscape. Catch your breath at the top of Castelo dos Mouros, and enjoy the spectacular view of Sintra! Experience an exhilarating adventure in Portugal with AESU! From the historic cities of Porto and Coimbra to the rich cultural center of Lisbon and striking beaches of the Algarve, Portugal offers history, stunning architecture, amazing food, and wine, plus unlimited adventures for adrenaline seekers! This entry was posted on Wednesday, March 27th, 2019	at 10:53 am	. You can follow any responses to this entry through the RSS 2.0	feed. You can leave a response, or trackback from your own site.